I saw a pretty and summery meal involving a polenta terrine in the August/September issue of Donna Hay magazine and got inspired to make something similar. The terrine in the magazine was made with chorizo and spinach and was served with fresh mozzarella and cherry tomatoes, but my goal was to use some eggplant, summer squash, bell peppers, and greens from my CSA and make it a little more autumnal with a cooked tomato sauce. 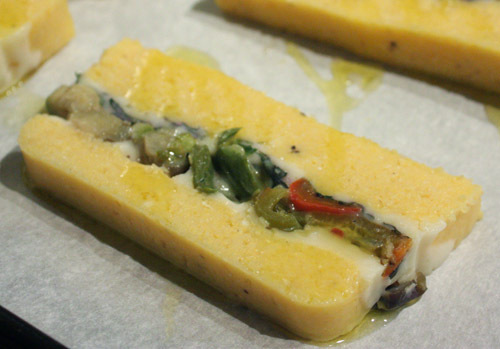 Polenta is great for a terrine because it sets up solidly and holds its shape very well. This couldn’t have been simpler to prepare, and once it has chilled for a few hours or overnight, it’s sliced and quickly warmed in the oven. I served the warmed slices with a spicy tomato sauce sprinkled with some chopped parsley. A basic polenta was made with broth, and when thick, grated parmesan and butter were added. I chopped eggplant, summer squash, and bell peppers and sauteed them until tender and added some baby mustard greens. Next time, I’ll chop the vegetables into a little smaller dice so they squish into the terrine more snuggly. 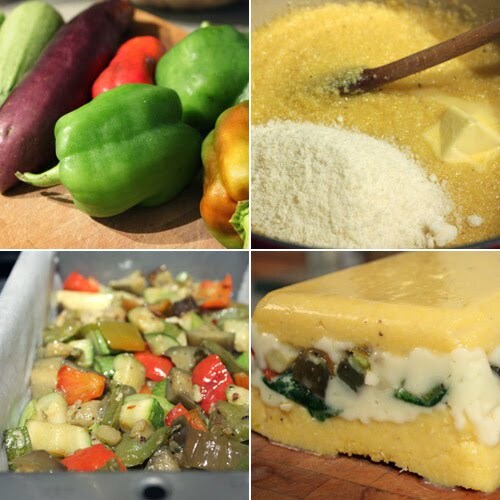 But, moving right along, a parchment-lined loaf pan was layered with polenta, then some shredded mozzarella, the sauteed vegetables, and more mozzarella, and then it was topped with the remaining polenta. The pan was covered and refrigerated overnight. The next day, the polenta came out of the pan easily and was cut into thick slices. The slices were placed on a baking sheet and drizzled with olive oil. They went into the oven for a few minutes to warm through. In hindsight, I should have pulled them from the oven a little sooner than I did because the mozzarella melted a bit too much and ran out from the sides of the cut pieces. The slices were prettier when the cheese is in place. Even though I would change a couple of details next time around, I was still very happy with this dish. The parmesan-flavored polenta sandwiching the vegetables and mozzarella was everything simple comfort food should be, even though it was smartly dressed in layers of a terrine. I had never before thought of using polenta in a terrine, but it works so well and the possibilities of what to layer with it are endless. -Heat 3 T oil in a large saute pan. Add diced vegetables and garlic slices and cook until tender. Season to taste with salt and pepper. When vegetables are tender and cooked through, add greens and stir to wilt. Remove from heat and set aside. -Place vegetable broth in a large saucepan, and bring to a boil. Slowly add polenta while whisking. Switch to a wooden spoon, turn heat down to medium, and stir until polenta is thick. This will be a few minutes for instant polenta. Add butter, parmesan, and salt and pepper to taste. Stir to incorporate. -Line a loaf pan with parchment paper allowing paper to overhang long sides. Place half the polenta in bottom of loaf pan. Top polenta with half the mozzarella. Top mozzarella with the vegetables, and then add the remaining mozzarella and polenta. Smooth the top, cover with plastic wrap, and refrigerate for at least two hours. -Once chilled and set, remove polenta from loaf pan and cut into thick slices while oven pre-heats to 400 degrees F. Place slices on a baking sheet and drizzle with olive oil. Bake just to warm through, about five minutes. Serve with a warm tomato sauce or fresh cherry tomatoes. -You can get as creative as you like with the layers, but I kept my simple with just one layer of vegetables. Great idea, Lisa. I love polenta but never have thought to make a terrine with it. Wouldn't wild mushrooms be great too? Although I do love eggplant. You're right- there are lots of possibilities. I have never cooked with polenta. This recipe looks really amazing. I like the colorful veggies in it. That looks absolutely delicious. I wonder how hard it is to get it to come out looking like that? Maybe, if I get some extra time this holiday week, I will try it. Check out this great Easy chicken and rice recipe! Nice. One of these days I'll eventually have to try making polenta. i love how the layers say in tact. Yum!! What a great idea! Lovely terrine with polenta! This looks so fresh and delicious. I really need to make polenta more! This looks so colorful and sounds healthy. 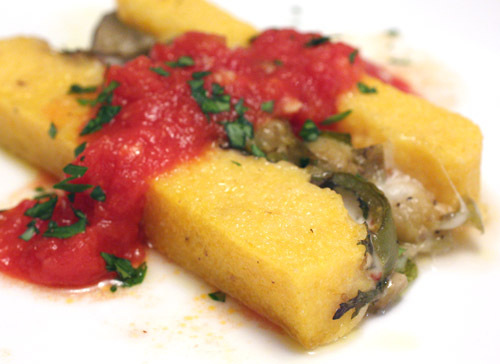 Never had polenta before, but this one makes me definitely curious with these vegetables. Such an beautiful, elegant dish! I love the look color and sound of this! Gotta try it! yumm! To show my appreciation for your lovely blog, please pick the Award from my place. Have a great day Lisa. That is a fabulous terrine! That kind of dish is always delicious and very enjoyable! Looks mouthwatering Lisa. Polenta is so wonderful in the Fall. Love polenta, what a perfect way to serve it. Absolutely gorgeous presentation, beautifully done! Beautiful, it's nice to use polenta for a terrine. Polenta is very common here in Switzerland but I have never cooked it myself, not a big fan myself but using it this way will make me change my mind probably. this is a real looker of a dish, and frankly, i think it might be the perfect use for polenta! gorgeous, tasty creation, lisa! Beautiful dish! I love all the vegetables, tomatoes, cheese, & polenta! Great flavor combo! What a terrific idea! I love polenta all ways but particularly like it firm. It never occurred to me to make it in a terrine form. Can't wait to try it! I have never cooked Polenta! This looks so pretty. wow-this is beautiful. 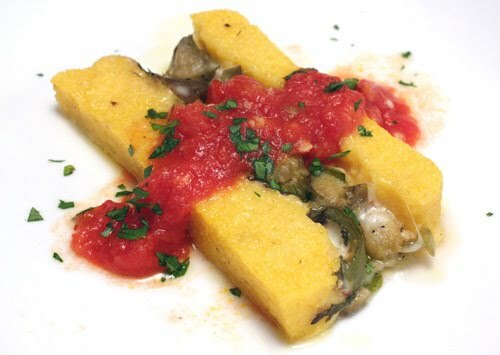 i absolutely adore polenta--i like the simplicity of this impressive-looking preparation. and a recipe,too? que fancy! I've never seen polenta made into a terrine. It's a great idea! And I bet it's delicious with the sauteed veggies and cheese. It's a lovely dish. Ooh, very pretty. I'm not familiar with Donna Hay magazine....gotta check that out. Cool, I have not either seen a polenta terrine, but imagine it is pretty darn good. I just made a brunch polenta scramble, and it turned out tasty! What a cool dish! It looks delicious and is pretty enough for company! What a great idea - so elegant and delicious looking! what an interesting and unique way of using polenta which doesn't seem too hard to make. I think I will try this one.